Unbeatable 1 Year Parts & Labour Warranty. Say Hello to offroad with your hoverboard. 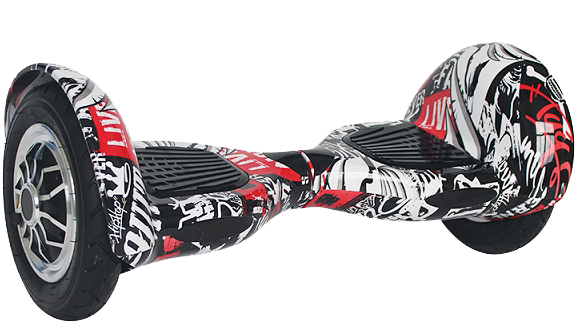 Our Generation 4 hoverboard is equipped with 10" pnuematic tires for all of your adventures. Great for campgrounds, parks and beaches as well as rough roads and the only hoverboard that is easy to ride on gravel. Say Hello to offroading. Our Generation 4 hoverboard is equipped with 10" pnuematic tires for all of your adventures. Great for campgrounds, parks and beaches as well as rough roads. They are easy to learn how to ride and fun to use. We have customers from 5 to 75 years old that ride them. Your order will be shipped from our warehouse in Wetaskiwin Alberta (Just South of Edmonton) for quick delivery times. Orders placed by noon will usually ship the same business day. Delivery times vary from 1 to 3 days to most Canadian addresses. Shipping is free to 94% of Canadian residences. Our hoverboards use only UL (Underwriters Laboratories) Certified Lithium Ion Batteries and Chargers which ensure that they are 100% safe. There have never been any recalls on any of our hoverboards. We only sell the best quality products and stand behind them for the warranty period of ONE YEAR. We provide an English written Quick Start guide with every shipment as well as the English (Chinese translated) owner's manual that comes with the board. This kit eliminates the bungee strap attaching belt and replaces it with a more secure strap. Strapping a Mini-Kart racer on your hoverboard will add hours of entertainment. This Hoverboard Shop website is operated by Super-Bee Truck Accessories. All product is shipped from our warehouse in Wetaskiwin Alberta. All prices are in Canadian Dollars.